I always leave one bullet, either for myself or for my enemy. Mission Impossible 2, we would have had a much better movie. Now, some folks might be able to dig into the Killer and see that it is nothing more than a typical cop movie, but the fact that it never tries to be anything more is what sets it apart. The movie isn't here to win awards for originality or story or even acting. It is here to show two guys kill about half of Hong Kong wearing pretty white sweat suits. There is a touch of story that mainly deals with cops and killers and their common code of honor, but luckily we aren't ever given enough time to think about this before something explodes and our heroes go crazy, shooting folks with two guns in slow motion. This movie defines two very important rules for action movies. First, the before mentioned 14 minute rule. Second, there should be at least one shot of our hero shooting with two guns in slow motion. There have been at least two DVD releases of The Killer. The first one I purchased was a Criterion version which is now out of print and runs for three figures on Ebay. The second version just came out and has just about all the same features except for the directors commentary track. Both version are non-anamorphic and only in mono. To be honest, this gives the film a somewhat bootleg like feel that actually adds to the nostalgia. Still, it would be great to get a 16x9 enhanced picture or Dolby Digital sound. 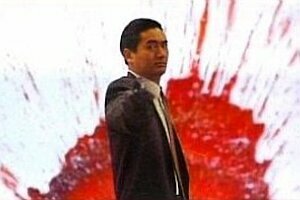 John Woo's The Killer is the de facto standard for all action movies. You will notice a lot of his trademarks in just about every gunslinging action movie today including Lethal Weapon 4, Desperado and Blade. Woo is just about fully responsible for converting old clunky action movies into the blood operas they are today. He should be known as a hero to the industry.